Flagship's modern luxury yachts make an ideal venue for group outings with a splash of excitement. Take advantage of all San Diego has to offer—perfect weather, stunning skyline, the tranquil beauty of the bay—and plan an event that's sure to leave a lasting impression on your entire group. Our event staff will provide first-class service. The bay will provide endless photo opportunities and give your event a sense of wonder and surprise. Every detail counts on your special day. 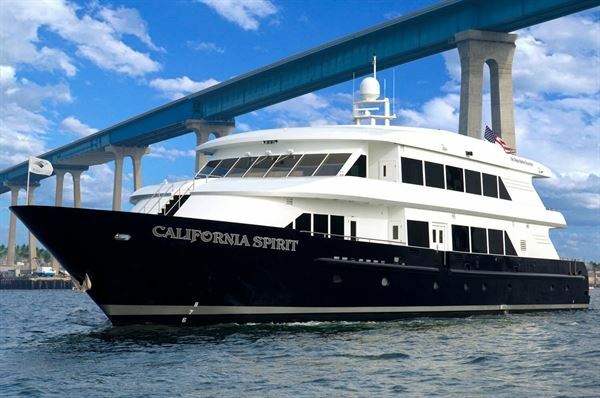 Host your wedding event aboard a luxury yacht, the most romantic venue in San Diego. Great for ceremony and receptions, rehearsal dinners, bridal showers, bachelor and bachelorette parties and vow renewals. Breathe some fresh air into your next corporate event. Choose the perfect "only in San Diego" venue for meetings outside the office, holiday parties, corporate celebrations, convention dinners, offsite team-building outings, employee appreciation and after-hours social events. It arrives with the invitation. A magical feeling of excitement. Anticipation. Curiosity. At last, the day comes. The first glimpse of the yacht, elegantly swaying in the bay, dappled in twinkling lights. The gentle breeze. The uniformed crew. In every direction, memories waiting to be captured and treasured. Every detail as perfect as you dreamed it. All for you. Your vows. Your first dance. Everyone you love. At the center of San Diego’s beauty. You are floating. This is your wedding. Prices vary greatly based on boat, guests and season/day of the week. See our attached wedding packet for details.